Pictured left to right are: Theresa Houston, RN, BSN,CCRN; Jacqueline Cooke, RN, MSN; Mike Knapp, RN, MSN, NEA-BC, Director of Nursing; Denice Powell, RN, Interim Nurse Manager Women’s Health Pavilion; and Kathy Cannatelli, RN, BSN, Nurse Manager ICU & Vascular Access Services. Patient Care Services at Beebe Medical Center is proud to announce another initiative in Beebe’s efforts to continually improve the quality and safety of the care that we provide our patients. Patient Care Services has created the Clinical Nurse Educator role that is being introduced into different patient units throughout the hospital, starting with Women’s Health and Critical Care. The Clinical Nurse Educators will work at the bedside with our nursing staff members to coach, mentor, and educate them on the latest evidenced-based practices as those practices become recognized within the nation’s healthcare community so that our patients receive the highest level of quality care. In addition, the educators will develop a strong partnership with Nurse Managers to ensure that the orientation of new staff, competencies, and future educational planning strategies are streamlined, coordinated, and facilitated for all staff in those service areas. Theresa Houston, RN, BSN, CCRN, is the new Clinical Nurse Educator in the Critical Care area and Jacqueline Cooke, RN, MSN, is the new Clinical Nurse Educator in the Women’s Health area. Theresa most recently worked as an Accreditation and Infection Specialist in Infection Prevention at Beebe Medical Center. Previously, she worked in the Intensive Care Unit (ICU) and in the Cardiovascular Intensive Care Unit (CVICU) for three years. She has 20 years of experience as a nurse, 18 of which were in critical care. She is certified in critical care and currently completing a master’s degree in nursing education at Wilmington University. While at Beebe Medical Center, Theresa has been one of the leaders on a quality initiative to reduce infections from the use of urinary catheters (CAUTI). As a result of this initiative, catheter-associated urinary tract infections have been greatly reduced. For example, there have been no catheter-associated urinary tract infections in Beebe’s Intensive Care Unit for nearly three years. These efforts have been recognized and Theresa, together with the quality initiative team members Donna Anderson, RN, CIC, and Denise Larson, RN, MSN, will be presenting information on this initiative in June at the annual international conference of the Association for Professionals in Infection Control and Epidemiology (APIC). This annual conference draws more than 2,500 clinicians from around the world who focus on preventing infections. Jackie is a newcomer to Beebe Medical Center. She has spent 18 years in various settings within the field of women’s health to include hospitals, private practice, and teaching undergraduate and graduate nursing courses at the University of Delaware. She has bachelors’ degrees in business and nursing from the University of Delaware and a graduate degree from Alleghany University (Hahnemann University) as a Women’s Health Nurse Practitioner. Beebe Medical Center is a not-for-profit community medical center with a charitable mission to encourage healthy living, prevent illness, and restore optimal health with the people residing, working, or visiting in the communities we serve. 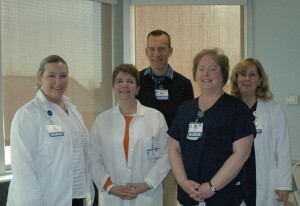 For more information, please visit us online at www.beebemed.org Caption: Pictured left to right are: Theresa Houston, RN, BSN,CCRN; Jacqueline Cooke, RN, MSN; Mike Knapp, RN, MSN, NEA-BC, Director of Nursing; Denice Powell, RN, Interim Nurse Manager Women’s Health Pavilion; and Kathy Cannatelli, RN, BSN, Nurse Manager ICU & Vascular Access Services.